This piano dolly pair is the ideal tool to use when moving upright pianos, large file cabinets, and other cumbersome objects where a regular hand truck won't cut it. 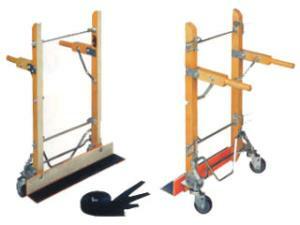 A dolly goes on either side of the item, and is held in place by two straps that run between the two dollies. A foot lever raises the item up onto the included caster wheels, and attached handles help to guide the item once on the wheels. * Please call us for any questions on our piano dolly pair rentals in Hillsdale and Ridgewood NJ.